I assume you’ve come to this page because you’ve read my book and are looking for more information. Below are pictures and diagrams relating to scenes from Ghost Waves. Many of the adventures that Thomas, Elizabeth, Matthew and Nicole find themselves in are things that I’ve done or places I’ve been. 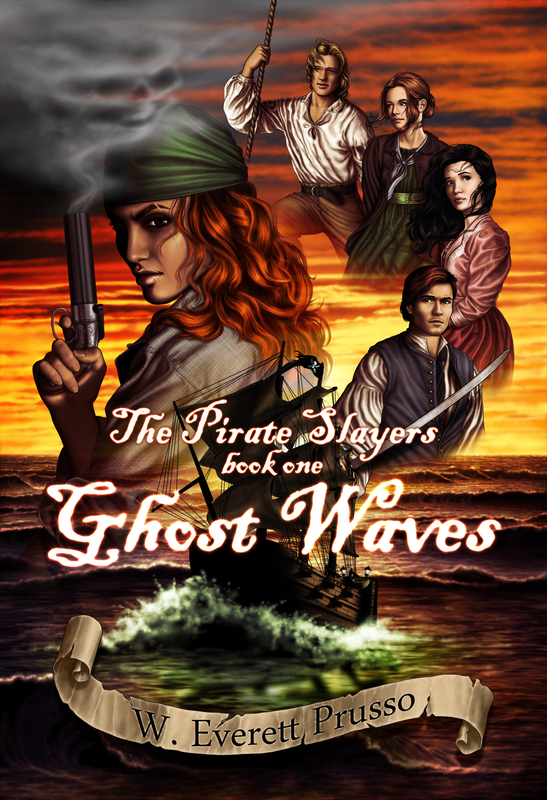 I hope you enjoy this page and the pictures and hope that it enhances your reading experience with Ghost Waves. This island is similar to the one that the foursome first land after spending a night on a rock.and where they build their first raft. Take a good look at this little cove. See the cave on the right hand side of the beach? See the little cabin nestled in the coconut trees? You can almost imagine the foursome as they first rounded the rocky promontory on the left and discovered this little cove. Elizabeth Island was fun to write and invent. It is a compilation of places I’ve been. Hanauma Bay, Hanakapii Falls, tramping though the jungle to Sacred Falls on O’ahu and diving on St. Johns, USVI. Magnolia is a ketch (above) and Rose is a sloop (below). There is a spot in the book where the foursome face intersecting waves. When waves cross, the energy doubles, creating monstrous swells. Imagine facing this wall of water on a bamboo raft! In Hawaii on a dark night, when a wave crashes, you can see a slight glow of green. This glow comes from zillions of tiny plankton. The process is called, bio-luminescence. On February 4th, 1846 the Brooklyn left from New York City with 238 Mormon passengers for a 26,000 mile voyage to Honolulu, dropped a consignment shipment, then to San Francisco, arriving in July. When the passengers disembarked on the shores of, what was then called, Yerba Buena Cove, they doubled the population of the city! This group started the first newspaper and the first English speaking school in San Francisco. Coconut Husk rope is very common throughout Polynesia and Southeast Asia. It is strong and easy to make and would be perfect for building a bamboo raft. If you look carefully under the golden scroll work by the ships name, you will see the broken chain locker called the cave. This is of course, a photo-shopped picture, but you get the concept of where the cave would be. I would venture to guess that most people don’t realize that coconuts come in a very thick, very strong fibrous husk. (not like in the grocery stores) If you’ve ever tried to remove the husk, you know how difficult it can be. But, put a sharpened stick in the ground, slam the coconut on it and twist, and the husk just peals off. The Southern Cross is to the southern hemisphere what the North Star is to the northern Hemisphere. Ships have used the Southern Cross to navigate by for hundreds of years. It is also the star formation on the Australian flag.